The West Highland Terrier, also affectionately known as the ‘Westie’, is a small, lovable, energetic dog breed that doubles as a nightmare for small rodents. Westies need plenty of playtime, and are very agile (mostly due to their lineage as hunters and working dogs). This is good news for engaging dog owners—but it may also leave you with a few questions regarding diet. More specifically, what do you feed such a sociable and energetic dog breed? Luckily for you, we’ve been doing some research regarding the best dog food choices for Westies to help you figure it out. This article should give you everything you need to select the perfect food for your new canine companion! **Below, you'll find our expert's breed-specific advice, but you can also click the links above to see current prices or read customer reviews on Chewy. Westies are fairly small. Adults typically weigh in at only 13 to 22 pounds. But with that being said—this is definitely not an animal with ‘small’ caloric or nutritional requirements! They’re so energetic, which means that you’ll need to customize their caloric intake to match their activity level. For Westies that are less active, you’ll need to feed about 450 calories per day. For those that are moderately active, daily caloric intake will need to be closer to 560. If your Westie tends to be very active, you’ll need to feed him/her somewhere between 615 and 1200 calories per day. The specific-amount, in this case, will be dependent upon how strenuous the daily activity tends to be. You can find more excellent information on the proper care and feeding of a Westie in this article, published by petcarerx.com. Youtube is an excellent source of information on basically any topic—including dogs! Here’s a Youtube video I found (created by Dogs 101) about Westies that provides some interesting information about the breed’s background—as well as some awesome advice on training and raising them. If you’re thinking about getting a Westie, or have already done so and are looking for additional information, then I would definitely recommend that you check it out. The West Highland Terrier requires a food that’s protein rich and carbohydrate light. This will give them plenty of energy, but will also keep them from filling up on empty calories. A diet that’s rich in Omega 3 fatty acids is also very good for the Westie, as is a dog food that contains plenty of antioxidants and a quality range of fresh fruits and vegetables. Ingredients like wild-caught salmon, chicken, or turkey will help to provide many of the meat-based proteins that this dog breed needs, while fruits and vegetables will help to improve metabolism and also support a healthier digestive tract. 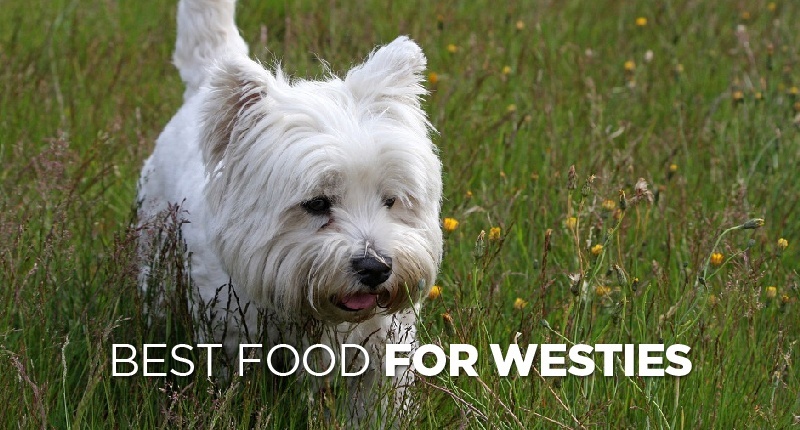 Ingredients like kelp, blueberries, carrots, and pumpkin are also good for Westies—as they’re awesome at protecting the breed from some of the more common eye problems that they tend to deal with. A grain-free food is probably the way to go with this breed, as it will help with digestion and serve their need for a healthy, high-quality diet that’s low on fillers and high in real nutritional value. While Westies tend to be sturdy dogs, they are susceptible to a number of health conditions and problems. Here are some of the most common and notable from among them that owners of West Highland White Terriers should look out for. Westies, being terriers, tend to suffer from allergies—especially when it comes to their skin. Feeding your dog a hypoallergenic dog food that contains only a few basic ingredients can really help with this. This disease, sometimes called Westie Armadillo Syndrome, is actually an inherited skin disease that can become pretty serious for the animal if left unchecked. It generally manifests itself between 3 and 12 months of age, and is characterized by inflamed and itchy skin that starts on the head, feet, and belly. This ‘itchy skin’, however, soon spreads over the entire body. The infected Westie might even lose its hair if the condition isn’t controlled. This disease is incurable—but it can be managed with medication and a proper diet. Aggressive antimicrobial therapy is usually the only way to combat the symptoms of this very unfortunate skin condition. For more information on this specific ailment, take a look at this article. This disease is caused by a deficient production of glucocorticoids and/or mineralocorticoids within your pet’s body. Symptoms may include low blood pressure, depression, weakness, dehydration, vomiting, heart toxicity, weight loss, bloody feces, and/or pain in the abdomen. Feeding your dog a diet that’s rich in human-grade, whole ingredients (such as those found in high-quality dog foods) can be a big help in dealing with this condition. Avoiding cheap dog foods is also important, as they almost never contain wholesome, healthy components. Rotating high-quality dog foods is another good idea, as it helps to fill nutritional gaps that might be affecting the overall health and well-being of your pet. Here are some other health and medical problems that can manifest themselves in this small, energetic dog breed. Craniomandibular Osteopathy (affects the skull bones of growing puppies—can be helped with proper nutrition) This condition is believed to be hereditary, and usually shows up between the ages of 4 to 8 months in this dog breed. It basically affects the skull bones, and causes them to be irregularly enlarged. The puppy will often ‘catch up’ with the growth, but the mean-time may be painful. Proper nutrition is a must for a puppy afflicted with this condition, and sometimes a feeding tube might be required. Legg-Calve-Perthes Disease (affects the head of the femur and the pelvis) This condition affects the thigh bone of your pet. Basically, a decreased blood supply will cause the head of the femur to begin to disintegrate where it would attach to the pelvis. The dog may limp and experience muscle problems as symptoms, which show up between the ages of 4 to 6 months of age in most cases. A diet healthy in antioxidants, turmeric, and Omega 3 fatty acids can help the dog to deal with the condition, though surgery is needed to correct it altogether. You can learn more about this condition here, in a very informative article on the subject that was published on petmd.com. Cataracts This eye condition manifests itself as one or two ‘cloudy eyes’ that might look grey or bluish. They’re more likely to appear in older dogs, and may or may not actually affect your dog’s vision. A diet that’s rich in antioxidants can help to prevent cataracts—though once they progress to a certain point, your dog might need surgery to correct the problem altogether. 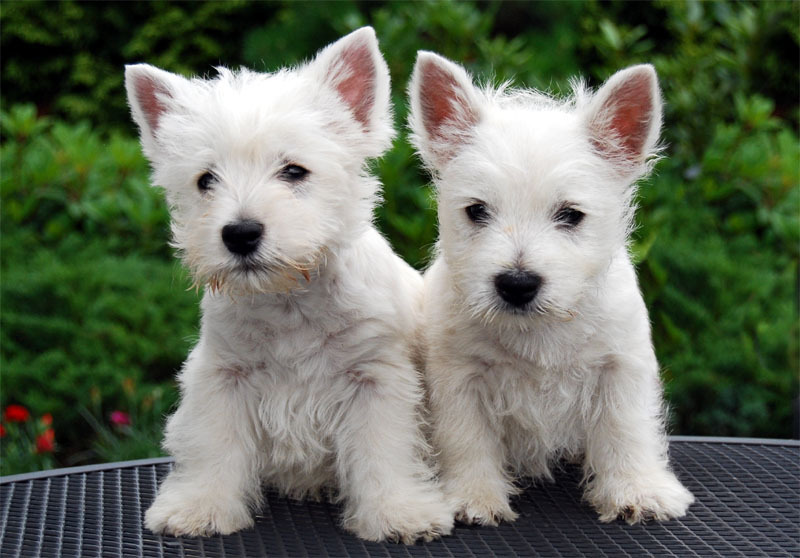 Westie mothers will usually begin weaning the puppies on her own about 5 to 8 weeks after birth. This is a time of crucial social development for the breed. This is when the puppies learn to socialize with other dogs, so it’s important that the Westie pup not be separated from its mother or litter until these skills have been acquired. For this reason, it’s generally recommended that you wait until the puppy is over 8 weeks old to bring it home. Puppies of this breed will usually weigh 4-5 pounds by the time they’re 6 weeks old. Moderately active pups in this weight range will generally need about 245 calories per day for proper nutrition. This will ensure that they’re receiving enough energy from their food for playing, learning, and exploring. Most Westie owners switch their dog from puppy food to adult dog food at about the one-year mark—though some make the switch-over at around 10 months if it seems better for the dog (especially if the dog’s growth has become slower). We’ve done a lot of research to answer this question, and have decided (hands down) that our top pick Westie dog food is definitely Wellness CORE Natural Grain Free Dry Dog Food, Small Breed Health Turkey & Chicken Recipe. It’s 100% natural, contains enough calcium, glucosamine, and chondroitin to maintain positive bone health (which is especially important for smaller dogs like this), and is also grain-free. It’s made with high-quality ingredients like chicken and turkey, and contains fruits and vegetables that will support your dog’s overall health and well-being. It’s also fortified with probiotics, antioxidants, vitamins, and minerals; all of which are essential to the Westie’s needs—and contains ingredients like fish and flax to bolster skin and coat health. For owners who want to raise their West Highland White Terriers on a diet that’ll provide digestibility, optimal nutrition, and a diverse range of animal-based protein, this definitely seems to be a choice that’s consistently popular and well-reviewed. Choosing the right dog food for your dog is extremely important—so don’t fall into the habit of buying that ‘cheap stuff’ that you see at the local chain-retail stores. Cheap dog food often contains ingredients that are nutritionally deficient. They also tend to contain a lot of ‘filler’ material—which is basically intended to ‘take up space’ and is usually devoid of any real, measurable nutritional value. We enthusiastically recommend Wellness CORE Natural Grain Free Dry Dog Food, Small Breed for any Westies that are getting ready to make the transition to adult dog food. Packed with wholesome ingredients and fortified with antioxidants, we don’t feel that there are many choices better than this for an energetic, sociable breed like the Westie.